Happy Friday, welcome to another weekly Bloggers Challenge. This weeks challenge was to create something for Mother's Day - this could be for Mom/Aunt/Sister/Grandma. I've been wanting to make a Concertina Booklet for along time, and this seemed like the perfect opportunity. I didn't put anything in the openings, but it would be a great place for pictures, or to add some journaling. I also thought about Die Cutting some Butterflies and adding those to the book, but needed to get my post up. If I make any changes, I'll be sure to photograph them and post here on my blog. The inside pages were all stamped using Fifth Avenue Floral, in Pacific Point, Baja Breeze and Sahara Sandy. For the outside cover I adhered a piece of Parisian Breeze DSP to Chocolate Chip, then to the Sahara Sand base. Stamped my Fifth Avenue Floral image in Chocolate Chip on Baja Breeze, cut out different panels, sponged the edges and popped them up on dimensionals. I used White Satin Ribbon to tie my book shut, the ribbon slides under the Rose and ties at the side. Here's pictures of the inside and a view from the top, so you can see what it looks like when opened. Be sure to click the photo's for a larger view. I think this would make a wonderful Wedding Album too, or even done up in pinks and blues for a baby. ETA - I've had a few people ask me for directions - I don't have time to write them up in a post today with pictures. Check back next week - I should have them up then. If you don't have my blog bookmarked, just click on the "Follow my Blog" or "Subscribe to my Blog" for updates, so you don't miss the post. Thanks! Thanks for stopping by, I hope all the mother's enjoy their Mother's Day weekend. Be sure to click on the Bloggers Challenge Logo on my sidebar to see what the other Challenge Members created this week. Pretty Lisa and what a perfect gift! Is that really compicated to do? Wowsers, that is awesome. When I first saw the pic of the flower, I thought wow - then I saw the rest of your creation and was blown away! WOW, WOW, WOW! You've outdone yourself, Lisa! OMG!!!!! This is just awesome and I sooooo need to case this idea!!! Wow!! That is awesome and of course I *love* the colors of it! This is soooo pretty1 Love the colors. Great gift idea too! Wow Lisa! Not just a card but a special gift as well. The colors are so beautiful. That rose is certainly the most popular stamp around here lately. I'm lovin' it! Could you please post the instructions on how to make that book, I loved it. Please !!!! Thanks. this is so pretty! the colors are perfect!! Oh Lisa, this is so beautiful!!! Love it!! What a good idea! This is great! Love that idea. Boy, that flower just looks good in any color doesn't it?! Oh my! That is just fantastic! Absolutely wonderful project! Fabulous - Need I say more!!! WOW! WOW! WOW! I'm speechless! What a priceless gift! This is so pretty and would make such a beautiful gift! Love the rose! Beautiful! What a great gift! Directions?????? love this, and what great real estate inside! It will be treasured for certain! Beautiful, Lisa! This will make a treasured gift. My hat off to you for trying this project...love it..
What a fabulous project! I love the design and your cover is gorgeous! Hope you had a great Mother's Day! Wow! 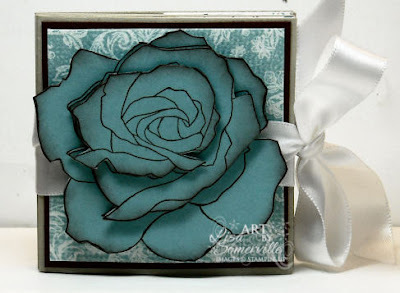 I love your project...and the blue rose is gorgeous! Can't wait to see the directions! Love the blue rose and the album is just FAB!! What a lovely gift this is for a variety of occasions!